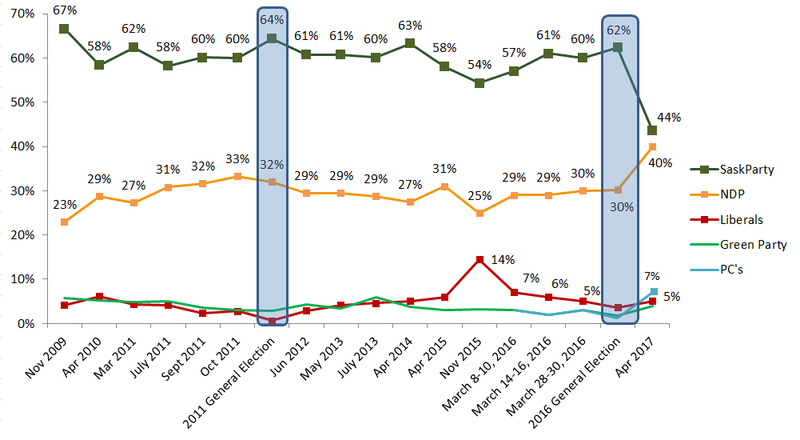 Voter intent shows, if an election were held today, SaskParty is at the lowest approval level since Insightrix began tracking in 2009. For the first time since being tracked, support for the SaskParty has fallen below 50% in Saskatchewan. Presently, 44% of decided Saskatchewan voters’* state they would cast their ballot for the SaskParty while 40% would vote for the provincial NDP, and 5% for the Liberals if a provincial election were held today. Fully 4% would vote for the Green Party and 7% for the Progressive Conservatives. Presently, 25% of respondents say they are undecided as to whom they would vote for if an election were held today. * Those who name a party for whom they intend to vote, and those who are uncertain but name a party towards which they are leaning. * Note the November 2009 statistic was from a similar poll conducted in partnership with Rawlco Radio. Those in Regina (60%) and Saskatoon (46%) are more likely to say they would vote for the NDP than those living in other areas of the province (32%). 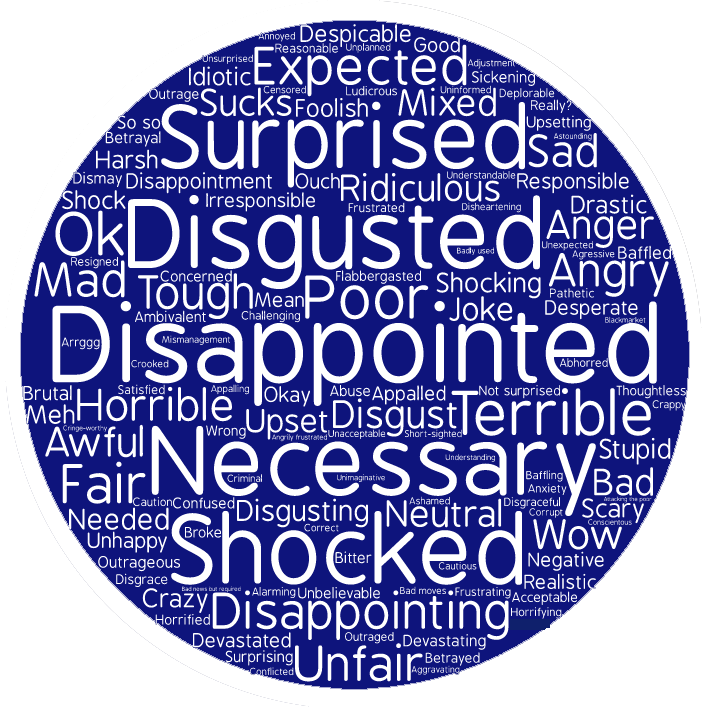 When asked to describe their thoughts about the budget in one word, a variety of adjectives are used. The following word cloud summarizes the common words provided. The larger the font size, the more frequently the word was said by respondents. Most adjectives are negative. When asked which segments of the population will benefit most from or will be hardest hit by the budget, a mix of responses are noted. 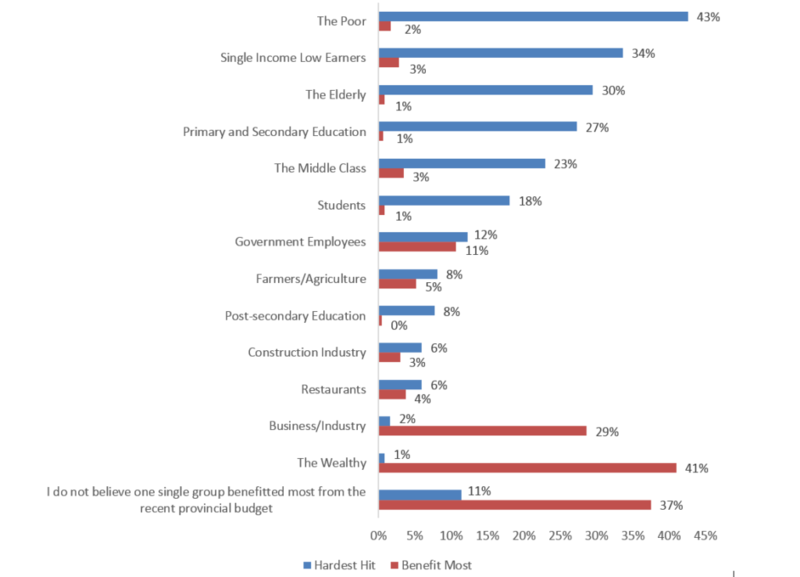 Most commonly, “the poor”, single income earners, the elderly, the education sector and the middle class are perceived to be most negatively impacted while the wealthy and the business sector are most likely to seem as benefiting from the budget. A total of 803 randomly selected, SaskWatch Research® panel members participated in the online research study from April 11 to 13, 2017. Quotas were set by age, gender and region to match the province’s general population. Since the research is conducted online, it is considered to be a non-probability proportion sample; therefore, margins of error are not applicable. Comparisons have been made to similar polls that used the same methodology, quotas and sample source. Insightrix began developing its SaskWatch Research® online market research panel in October 2007, using high quality techniques that include telephone recruitment and referrals from existing panel members. Presently, there are over 15,000 active panel members representing all regions of the province and distributions of the general population. The panel membership closely matches the 2011 Census based on age, gender, household composition, household income and education. For more information, please visit: http://saskwatch.ca.